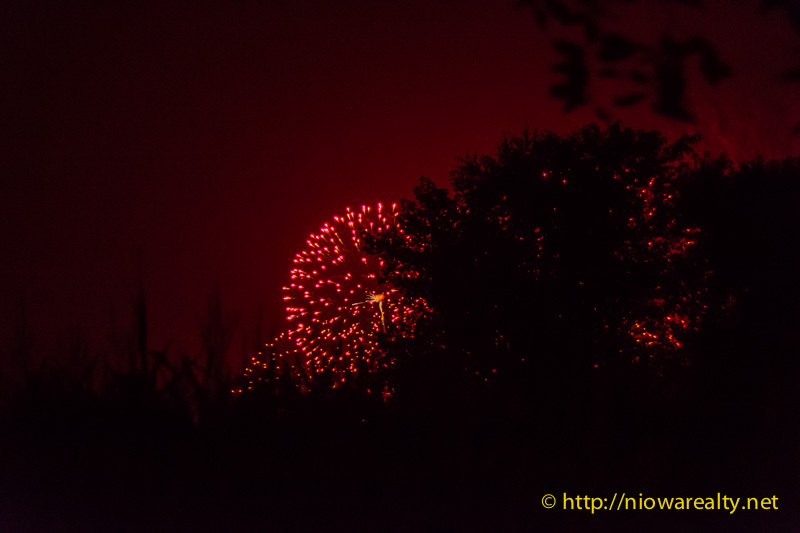 Share the post "Lighting the Sky"
Last night offered a wonderful display of fireworks in the night sky compliments of the week long stay of the Pyrotechnics Guild International Convention that is under way as of yesterday. There are expected to be 3,500 members from all over the United States as well as 19 countries of the world. The geographical location of Mason City places us in the center of traveling time for most of the members. We are very lucky to have them every year as they not only provide additional entertainment for the area residents, but also generate about 2 million dollars in revenue while here. The members daytime hours are spent honing their fireworks-making skills as well as developing new techniques. The evening shows are open to the general public for a nominal entrance fee. I’m confident everyone who decides to take in the show will walk away feeling it was well worth attending. I can’t imagine anyone growing bored from watching fireworks. Each burst of color and form in the sky is different from the last. They are like snowflakes—each one is different. I marvel at the ability of a pyrotechnic who basically takes a stick of gunpowder, color, and fire, and turns it into something so amazingly beautiful in the night sky. Mason City has indeed been fortunate this Summer to have the delightful RAGBRAI bicyclists spending a night filled with great entertainment as well as the pyrotechnics visiting for 8 days. It seems Mason City is becoming more and more a tourist attraction and I do hope this is just the beginning. We’ve got much to offer and hopefully the word is getting out across the country. Take a night this week and go watch the pyrotechnics as they are lighting the sky with beauty and grace. The photo above is just one of the works of art from last night.